Brother UK have been great advocates for apprenticeships over the years, using them to recruit new talent and develop the skills of their existing workforce. The Apprentice Academy resourced two College leavers last summer to become business administration apprentices, Lewis Johnstone and Grace Sherrington, both of whom are progressing well and making a real contribution to the business. 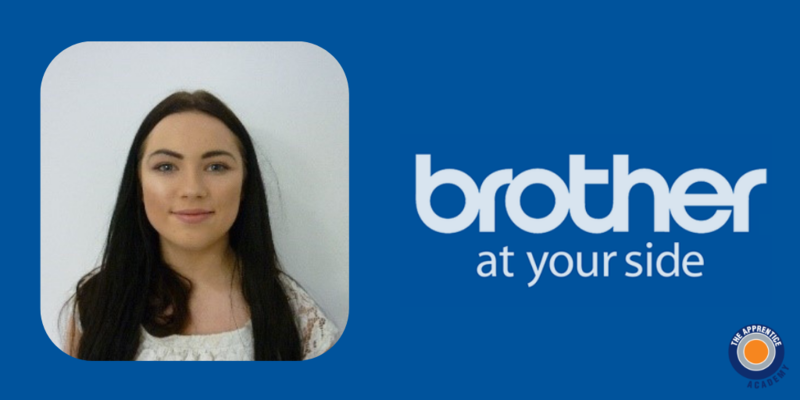 We have already talked about Lewis previously in the blog piece linked here, and so we asked Gemmer Crozier, the Community Engagement Coordinator at Brother UK how Grace was getting on. Gemmer who has completed both a Business Administration apprenticeship and Leadership and Management apprenticeship with The Academy, had some really positive words to say. It’s great to hear about how much Grace is progressing, despite only being less than half way through her apprenticeship. The support from Brother, plus visits from her Apprentice Academy coach Emma Brewer have contributed greatly to her ongoing development. Customer Service roles are not easy to start your career in, especially when you have just left education. The apprenticeship programme has given Grace the opportunity to practice the skills and the confidence she needs to excel in a difficult first role. At the Apprentice Academy, we pride ourselves in matching young people to apprenticeship positions, and it clear to see that Brother was a great fit for Grace!